This is the first in what I see becoming a series of posts where I can post up what I’m drinking right now. They won’t have the depth of analysis, but will give you some ideas of drinks you might want to try. 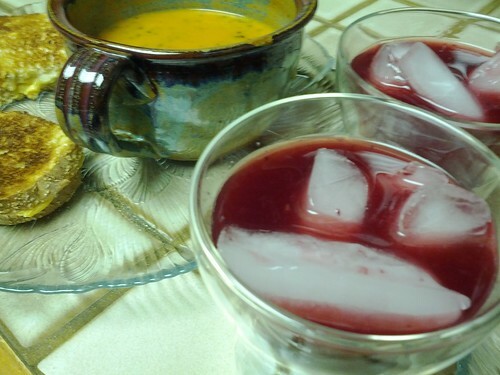 Tonight, we’re drinking Blood Orange Whiskey Sours. We’re in Grand Lake for the weekend and Elisabeth brought along blood oranges that she got in her produce box this week. Faced with a limited liquor cabinet but some solid basics I decided a riff on the classic Whiskey Sour would be great. Here’s the result. The simple syrup is variable because you really need to tweak it with this cocktail based on the sourness of your blood orange and lemon. Just give it a quick sample before you shake and adjust as needed. There is one iconic cocktail that is truly my constant fall back. It’s simple to the point of almost being silly, but in that same breath it’s deep, complex and nuanced. If you haven’t guessed already, I’m talking about the Old Fashioned. It’s the drink I crave when I want simplicity with depth, the drink I make when I travel and the one I make for people new to bourbon. Seemed only natural that I’d mix it up when I received samples of Basil Hayden’s and Knob Creek small batch bourbons. But before I tell you how they were, let’s talk about the bourbons themselves. You’ll see two terms tossed around with regard to bourbons; single barrel and small batch. Single barrel is just that, bourbon bottled from a single barrel, unblended. The problem you run into with single barrel bourbon is that, even with careful sampling, there is variation from bottle to bottle. Some people really enjoy this. They know the general flavor they’re going to get, but each bottle brings a small surprise in flavor. The folks at Jim Beam don’t like this variability, so they opt for small batch bourbon instead. Small batch bourbons are blends of a small number of barrels to create the flavor profile desired. There are a lot of benefits to this method, which Beam has put to good use. First, you can smooth out the variability from batch to batch. Since you’re blending barrels you can better tweak the exact flavor profile you’re after. Second, you can create a small host of labels from the same basic stock of aged bourbon. In the case of Beam you end up with Basil Hayden’s, Knob Creek, Baker’s and Booker’s. All of these expressions are the product of the same aging stock blended in different ratios to produce different flavor profiles. 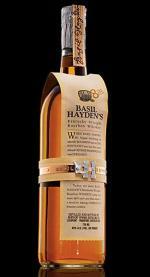 From the Beam site, Basil Hayden’s, bottled at a standard 80 proof has the highest rye portion giving it a spicy, peppery quality. 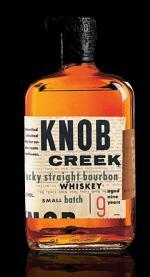 Knob Creek keeps a relatively high rye portion but bumps the proof up to 100 and the length of aging by a year. The product of these tweaks is fruitier, rich and lightly sweet. Baker’s keeps the higher proof at 107 but drops the aging to 7 years. The result is nutty with vanilla notes and a silky body. Finally, Booker’s is the bourbon created to reflect the bourbons of the past. Bottled at whatever the blended proof turns out to be (121 to 127 proof), no water is added and no filtration is done. The finished product has a lot more barrel character. But that’s what the producers have to say, how about we talk about what I think. Dark straw/light honey in color. Light and sweet with delicate vanilla flavors, this bourbon is tremendously smooth with a very long finish laced with vanilla. Definitely an amazing sipping bourbon. In an Old Fashioned the smoothness of this bourbon really shines. The vanilla and spice character of the rye comes through nicely. 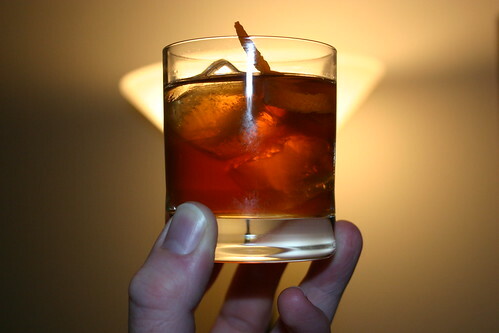 This is the sort of Old Fashioned that will sneak up on you with a hammer. They go down very very quickly and easily. Amber honey color with distinct notes of vanilla in the aroma. This bourbon is spicier and slightly hot with more spice (think Christmas) character. The finish is crisp, clean and short. Another great sipper if you like bourbons with rye character. In an Old Fashioned my initial thoughts sum it up nicely, “So tasty”. The bourbon shines through with spice notes and a bit of that characteristic rye fire. This is a complex, slow sipping Old Fashioned to be sure. It’s always easy for me to see why I like a simple Old Fashioned when I have bourbons like these to mix them with. The character of the spirit is preserved while adding complexity and depth at the same time. You truly can’t go wrong. And, I have to say, I’m really excited to try one with some Booker’s. I’ll keep you posted. I’m Not Dead – I Swear! Despite my lack of posting, I swear I’m not dead. Work has been tremendously complex the last couple months and while I still want cocktails when I get home, I rarely want to think and write about them. I’ve got a ton of posts in my mental hopper though, so stay tuned. I’ll be making my triumphant return very shortly!